Please join us this Tuesday, 7pm, at Branan Towers (1200 Glenwood Ave) as we will welcome our City Councilmember Natalyn Archibong as she shares her insights on important issues affecting Atlanta and District 5. Additionally, we will have voting opportunities on a couple of land use and zoning applications. Please be mindful that parking at Branan Towers is reserved for residents of the building. Parking is available throughout the Village and for meeting nights only, at First Iconium across Glenwood. Eight resources were newly added to the Georgia Register of Historic Places in August 2018. Nominations for these resources were approved during an August 24th meeting of the Georgia National Register Review Board, which is charged with evaluating National Register nominations from Georgia prior to their submission to the National Park Service for National Register of Historic Places listing. As Georgia’s state historic preservation office (SHPO), the Historic Preservation Division (HPD) administers the National Register of Historic Places program in Georgia. 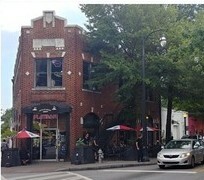 Cascade Heights Commercial Historic District, Atlanta, Fulton County – a small, multi-block district with historic resources such as retail commercial buildings, office buildings, gas stations, civic buildings, churches, and multi-family residential. The district is locally significant for its sustained role as the principal commercial center for the Cascade Heights area in suburban southwest Atlanta since the 1930s and was responsible for the social, spiritual and commercial needs of a growing suburban community. The district illustrates changing tastes, needs, and uses over a period of time - spanning streetcar and early automobile subdivision development to completely auto-centric suburban growth in Atlanta. East Atlanta Historic District, Atlanta, DeKalb County - a large and diverse neighborhood of single-family houses, apartments, commercial and civic buildings, a park, and a cemetery that straddles the eastern boundary of the city of Atlanta, and the western boundary of unincorporated DeKalb County. Its diverse historic resources and piecemeal development patterns reflect the area’s evolution from rural area, to Atlanta streetcar suburb, to automobile-oriented urban neighborhood. The district is significant as one of Dekalb County and Atlanta’s primary commercial nodes during the early to mid-20th century, and as an embodiment of the trends and changes that shaped and defined Dekalb County and Atlanta’s development during the late 19th and early to mid-20th centuries, including economic and political forces such as transportation improvements, urban consolidation, and integration leading to demographic shifts in the 1960s. Sandersville High School, Sandersville, Washington County – a consolidated school that initially served grades 1-11 of the northern half of Washington County following its opening in 1939. With its Colonial Revival-style elements and E-shaped plan, the school is a good example of the work of prolific Atlanta-based architect William J.J. Chase, who designed over 100 schools in the state of Georgia. Its intact E-plan, which housed classrooms, administrative offices, a library, labs, and an auditorium (the largest in the county), along with later outbuildings, conveys the school consolidation that occurred in response to education concerns in the state of Georgia in the early 20th century and the expansion of those consolidated schools over time. Atlanta-Fulton Central Library, Atlanta, Fulton County – the library system’s central library and headquarters building located in the heart of downtown Atlanta and opened to the public in 1980. The massive, sculptural public building was the last completed work of master architect Marcel Breuer, as well as Breuer’s only known work in Georgia. Additionally, its hard-edged geometric angles, few windows which often appear as voids, widespread use of concrete, and broad stretches of exterior wall interrupted by deep recesses make it an excellent example of the Brutalist style in Atlanta. Plan for a night that evokes Sin City with the charm of Ole Blue Eyes and the King. 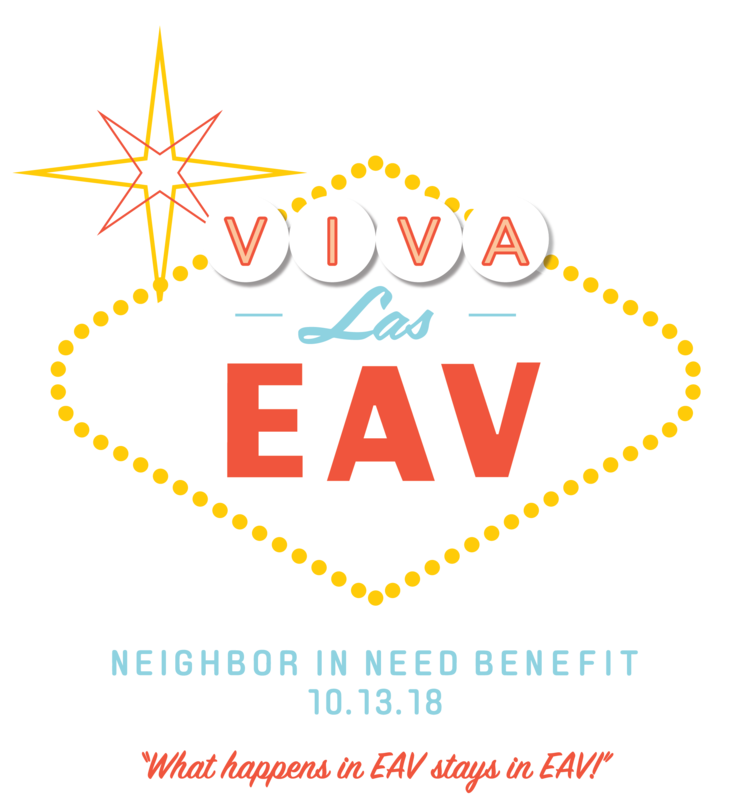 An evening filled with Glitz, Glam, Neon lights, and the sounds of slots machines will be the look and sound at Viva Las EAV. Casino games and prizes, awesome food and signature cocktails! What happens in EAV, stays in EAV! Proceeds from this event benefit Neighbor in Need, a local non-profit that helps seniors make much-needed housing repairs. 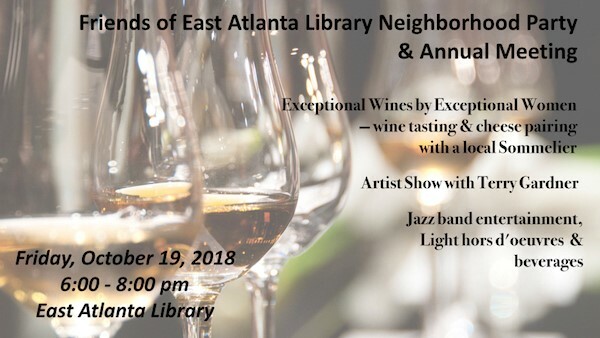 Come out for an evening with your Friends of the East Atlanta Library. Enjoy Exceptional Wines by Exceptional Women: From an Argentine Malbec to a Russian River Sauvignon Blanc, a local (OP) Sommelier Ryan Mullins will explore how women winemakers are influencing the wine world. Terry Barabino Gardner will exhibit her paintings and drawings at the East Atlanta Library. Her art reflects her interest in nature, wildlife, and for this exhibit, DOGS! Meet her and find out about her inspirations and aspirations. The exhibit opens October 6. This event is for adults only please. This neighborhood party is open to the public and free to attend. You do not have to be a member of Friends of East Atlanta Library, but of course we highly encourage you to join and support our local library! The family-friendly festival will feature a pet parade, Halloween costume contest and more! On Sunday, Oct. 21, from noon-3 p.m., hundreds of Atlantans of all ages, and dogs of all breeds, will once again fill the streets of East Atlanta Village for Halloween-themed fun – and to raise funds for a worthy nonprofit. Every year, the annual Dogtoberfest benefits a new nonprofit that focuses on improving the lives of pets. This year’s beneficiary, The W-Underdogs, pairs at-risk youth in Peoplestown/South Atlanta with animals in need to teach the kids leadership, responsibility and compassion as they learn to train and care for dogs. East Atlanta resident Lauren Janis, founder of Big Daddy Biscuits, first launched Dogtoberfest (a 501c3 nonprofit) in 2013 to celebrate responsible pet ownership. Meeting adoptable dogs and cats. Watching, or joining in on, the pet parade. A chance to win wonderful prizes by entering the pet costume contest. All dogs entering Dogtoberfest will need to be spayed/neutered and on leashes (not the retractable kind). The festival will take place at 572 Stokeswood Ave., Atlanta, Ga., 30316 (location of the East Atlanta Village Farmers Market). Event sponsors include Park Pet Supply, The Midway Pub, East Atlanta Animal Clinic, Joe's East Atlanta Coffee Shop, Furside EAV, Atlanta Movie Tours, Gone to the Dogs Pet Care, Traci with an Eye Graphic Design and others. 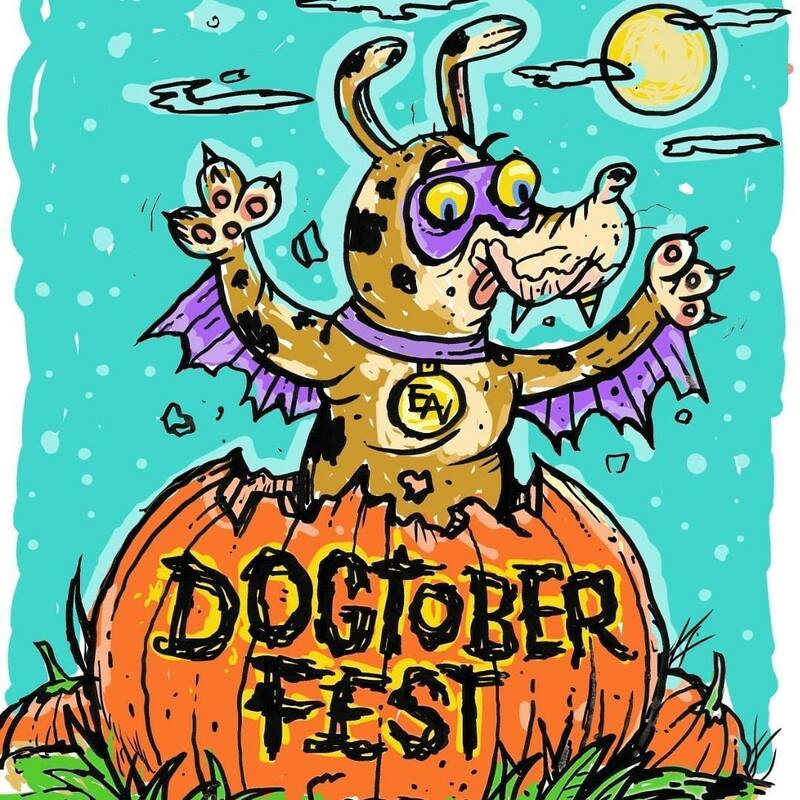 The 2018 logo for Dogtoberfest is designed by R. Land. EAVoween will start with the costume contest and have free costumes for anyone who needs them. Trick-or-treating starts at 6 pm in the village. We'll have additional games, music and fun for everyone to enjoy. Closing out the evening will be a showing of Hocus Pocus in the Farmer's Market area. If you have questions or would like more information about sponsorship levels, please contact eapn@eaca.net. If you're interested in joining a local playgroup, meet other parents, or make some new friends then let us know! 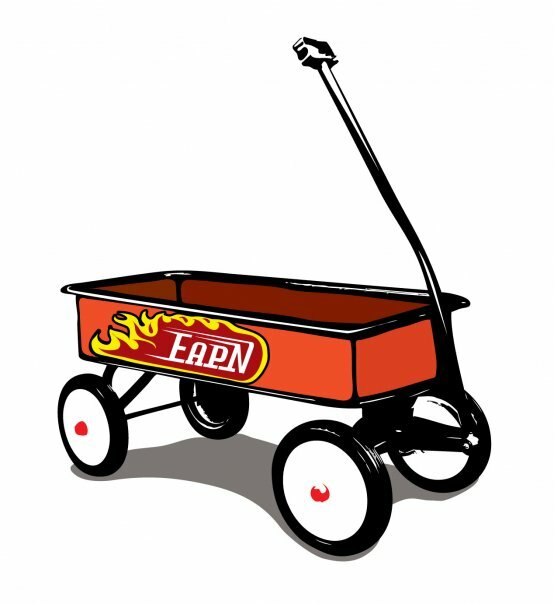 Join the EAPN Facebook page and sign up for a playgroup so our new playgroup chair can connect you to other parents! What Are You Doing Saturday Night? Have you more or less given up on the movies? Are you tired of wasting a Saturday night on a half hour of commercials and two hours of explosions at the multiplex? Instead, how about watching a quality movie and then discussing it in a friendly atmosphere – with good food? Film buffs in southeast Atlanta have been doing just that once a month for the last dozen years in Life is Too Short to Watch Lousy Movies. The group is open to new participants on a space-available basis and will soon be signing up Regulars for its 2019 season. Life is Too Short... screens classics as well as more modern films on the second Saturday of every month. So far this year they have raised Cain with Marlon Brando in The Wild One (1953), explored dysfunctional families with Bette Davis in Lillian Hellman’s The Little Foxes (1941), rooted for Harold Lloyd against bullies, thieves, and a manic monkey in The Kid Brother (1927), and empathized with star-crossed lovers in Wong Kar-Wai’s modern classic In the Mood For Love (2000), among others. Looking ahead, for Halloween they'll pray for deliverance from terrifying invaders, and for the holidays they'll celebrate the dance with Fred Astaire and then contemplate Utopia with Frank Capra. The group meets in a private home in Ormewood Park. While they average fifteen or so at each screening, they do expect to have a few openings for 2019. Regular participation with guaranteed seating and space-available participation are both available. There is no charge for the movies or the programs, which usually include coming attractions, a cartoon, and clips from other films or documentaries. The group is run by longtime neighborhood resident and film buff Steve Whiteman. Because the evening is more than just a “movie night,” new people should have a look at the group's website, ClassicFilmAppreciation.webs.com, which explains how things work and includes detailed program examples, photos from meetings, and testimonials. Then if they would like to be notified of future films they can sign up for the mailing list as a space-available Drop-In participant on the Contact Us page of the site. After attending a couple of screenings, signing up as a Regular gets a guaranteed seat and additional benefits. Questions not answered on the website can be addressed to Steve at ClassicFilmAppreciation@gmail.com. And that's all, folks! See you right back here in two weeks. Please contact us at newsletter@eaca.net if you have any feedback -- we welcome it! Please include the relevant information, dates, times, locations, contact information, and images/graphics (optional). Submissions must be received by Friday at 10:00 pm EST. Copyright © 2018 East Atlanta Community Association, All rights reserved.